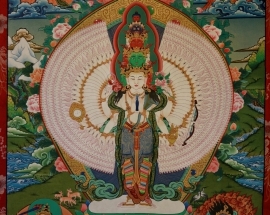 Avalokitesvara is a bodhisattva who embodies the compassion of all Buddhas. This bodhisattva is variably depicted, described and is portrayed in different cultures as either female or male. In Chinese Buddhism, Avalokiteśvara has become the somewhat different female figure Guanyin. In Cambodia, he appears as Lokesvarak, and in Japan, he is called Kanzeon or Kannon. 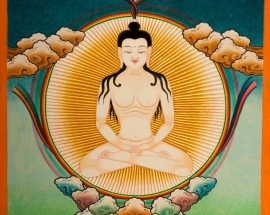 Avalokiteshvara is the earthly manifestation of the self-born eternal Buddha Amitabha, whose figure is represented in his headdress, and he guards the world in the interval between the departure of the historical Buddha, Gautama, and the appearance of the future Buddha, Maitreya. A Lord Buddha is a very holy person in Buddhism. The word Buddha means "enlightened one" in Sanskrit. Buddha was born Siddhartha Gautama. He was the man who started Buddhism. Sometimes people call him "the Buddha". Other times, people call any person a Buddha if they have found enlightenment. 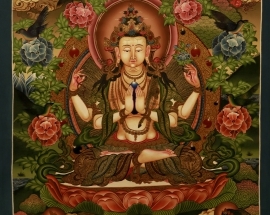 Cundi Bodhisattva is an induction of the strong, and respectful care to the Big Bodhisattva. Her fortune and wisdom are infinite. She is a great sorrowful sorrower who has been praying for a thousand years. She is the protector of a living being, and he has fulfilled all the wishes of the world and the world, showing the deepest blessing. Buddhism includes a wide array of divine beings that are venerated in various ritual and popular contexts. Initially, they included mainly Indian deities such as devas and yakshas but later came to include other Asian spirits and local gods. They range from enlightened Buddhas to regional spirits adopted by Buddhists or practiced on the margins of the religion. 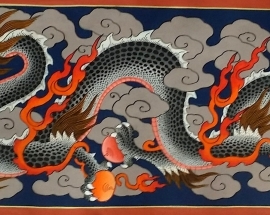 The dragon as a symbol of enlightenment. Today dragons decorate roofs and gates of temples, both as guardians and to symbolize the dragon's power of clarity. Buddhist dragons often are depicted holding a mani jewel, which represents the Buddha's teaching. Yama is a Tantric Buddhist. 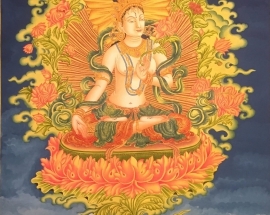 Yama is called as wisdom deity and protector of the Method Class (father) of Anuttaryoga Tantra specifically used by those engaged in the practices of the Vajrabhairava Tantra. This practice is found in all of the Sarma Schools (Sakya, Kagyu, Gelug, etc.) 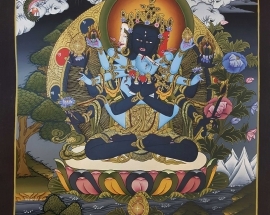 however the Gelugpa Tradition hold Yama Dharmaraja in a special regard as one of their three main religious protectors along with the Shadbhuja form of Mahakala and Vaishravana. 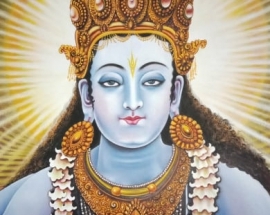 God of wealth is believed to help eliminate poverty and create financial stability. It is a spiritual belief to be wealthy that helps to minimize misfortunes and obstacles and increase good fortune and happiness. 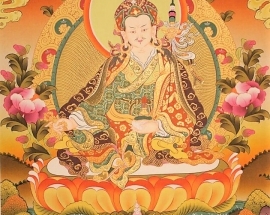 The honorific title by which he is generally known is Guru Rinpoche, Precious Teacher. He usually sits on a lotus that sprang up in a small lake, wrapped in heavy, expensive robes, and wears a hat with its earflaps up. He posses a vajra in his right hand and a kapala (skull cup) with a little jar of amrita in his left hand, and a khatvanga clamped against his left shoulder. 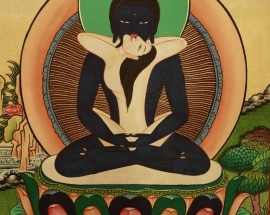 He is flanked by his consorts, the Indian princess Mandarava, who stands to his right, and Yeshe Tsogyal, who stands to the left, the two favorite and tantrically most gifted of his five wives. 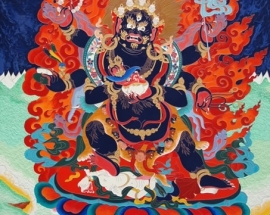 Mahakala is the wrathful emanation of the Buddha of Compassion appearing in the form of a Dharma Protector. 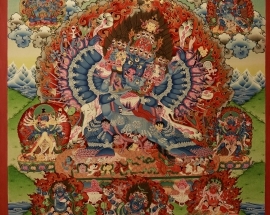 Mahakala, known as Daheitian in Chinese, has two, four, or six arms. 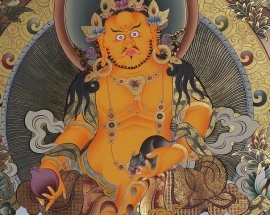 The two-armed Mahakala is the karma protector of the Karma Kagyu School. He has a wrathful expression to subdue inner demons. He is a symbol of fearlessness. Mandala is a graphic and often symbolic pattern usually in the form of a circle divided into four separate sections or bearing multiple projections of an image. 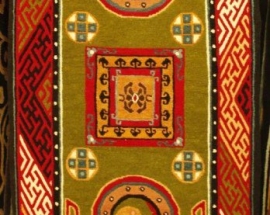 The mandala has reappeared in cultures and traditions throughout history, and the design and pattern it takes are often informed by the intended meaning of the piece. 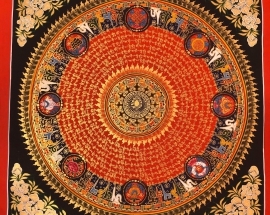 There are a number of traditional symbols used in mandala art that hail from Buddhist and Hindu imagery but many modern forms of mandala have begun incorporating modern takes on traditional symbols. 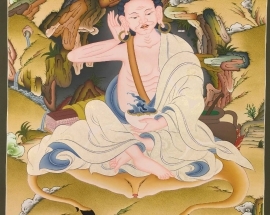 The knowledge of Tibetan Medicine, which is known for its effectiveness in treating not only physical but also mental illnesses, was written down about a thousand years ago in the book of the Four Medical Tantras. 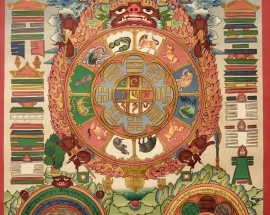 Medical Paintings is “one of the unique features of Traditional Tibetan Medicine is that it contains a comprehensive philosophy, cosmology, and system of subtle anatomy with associated spiritual practices”. Paubha Painting is the artwork made by the local community of Newar living in Kathmandu Nepal. Paubha is fine art. 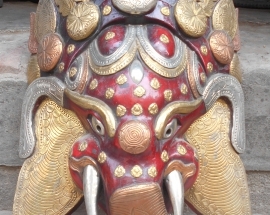 The Newari Thangkas or Paubhas have become a part of Kathmandu valley since the 13th century. This category contains all the types of Newari thangka designs found in Nepal. 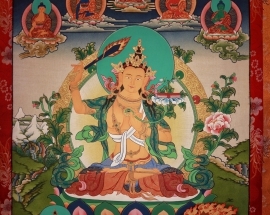 Tara is a meditation deity whose practice is used by practitioners of the Tibetan branch of Vajrayana Buddhism to develop certain inner qualities and understand outer, inner and secret teachings about compassion and emptiness. 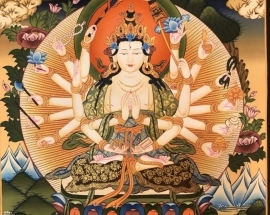 Tara may more properly be understood as different aspects of the same quality, as bodhisattvas are often considered metaphors for Buddhist virtues. In this category, you can find the Thangka related to the Tibetan calendar. These Thangkas are beautifully hand painted by professional Nepali Thangka artist living in Bhaktapur Nepal. 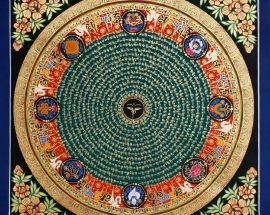 The Tibetan calendar is based on the cycles of the moon, and various dates are considered especially auspicious or inauspicious for certain practices. Tibetan Calendars are inspirational verses that lift up our emotional and spiritual needs clear our minds of negative thoughts and to become stress-free and balanced with nature. 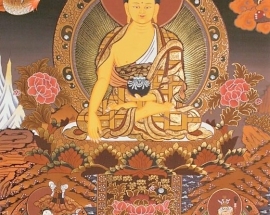 This category contains all the Thangkas of Tibetan Lamas and Teachers. The name Tsongkhapa is derived from a great meditator of Bodhisattva. The thangkas under Tsongkhapa generally includes tree-like structure. In the painting like Lineage Tree and Karmapa Buddha is seen getting knowledge and power from a supreme force, which is Tsongkhapa. 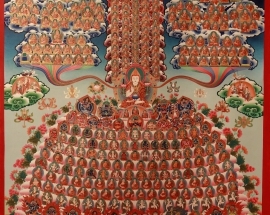 Lineage Tree and Karmapa, and Guru are the thangkas under this category. 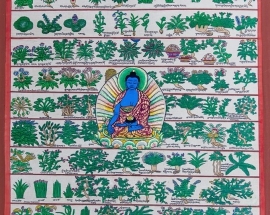 Tree Thangkas make beautiful, meaningful art. 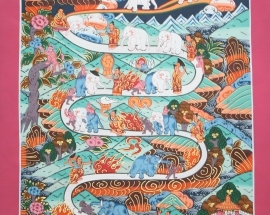 These thangkas varies widely. Some are called tree of life, while others are called lineage tree. 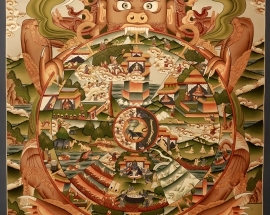 Tree thangka includes four basic elements, earth, fire, water, and air. Karmapa is the king of Victor and formally he is known as the head of Karma. Way to heaven is also called a way to enlightenment thangka painting. These are deeply symbolic thanka. The texts from which this illustration are shown, a long period of deep study of full understanding. 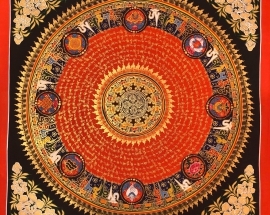 The Bhavachakra, the Wheel of Life or Wheel of Becoming, is a mandala - a complex picture representing the Buddhist view of the universe. To Buddhists, existence is a cycle of life, death, rebirth, and suffering that they seek to escape altogether. 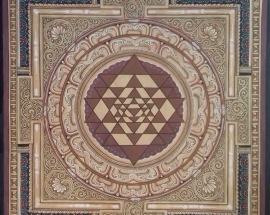 Yantra is a mystical diagram, mainly from the Tantric traditions of the Hindu religions. They are used for the worship of deities in temples or at home; as an aid in meditation; used for the benefits given by their supposed occult powers based on Hindu astrology and tantric texts. 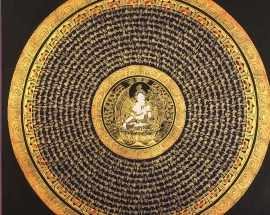 Om Mani Padme Hum Mandala with 8 auspicious symbols is beautifully handpainted on cotton canvas using mineral color, gold in black background. White Tara is a female Buddha associated with Long Life. 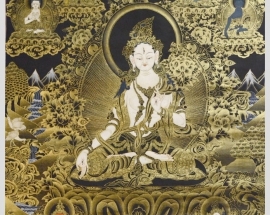 This Thangka is beautifully handpainted by the Master Thangka Artist in Newar style. This beautiful thangka is a hand painted by the artist of Bhaktapur Nepal. 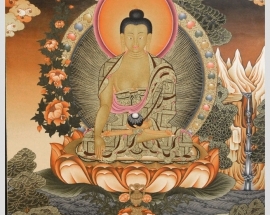 This Thangka is painted on handmade cotton canvas, Painted using natural color in a traditional Tibetan thangka color. 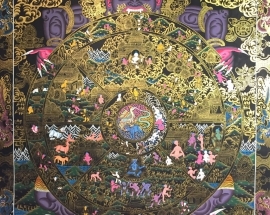 This mandala features the most famous Eight Auspicious Symbols of Mahayana and Vajrayana Buddhism known as Ashtamangala with golden mantras and red background around it. Sri Yantra Mandala is the most powerful sacred symbol used in India, Nepal, and Tibet for thousands of years. 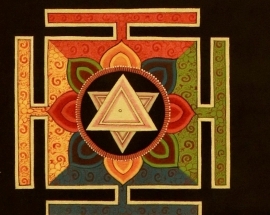 Sri Yantra is known to usher in peace, prosperity, harmony and good luck. 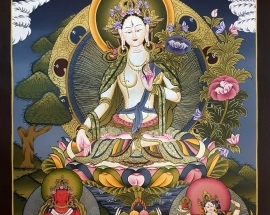 White Tara thangka is hand painted by the artist of Kathmandu, Nepal. White Tara is the mother of all Buddhas, also known as Female Buddha and the goddess of compassion and healing of the Tibetan Buddhist tradition. 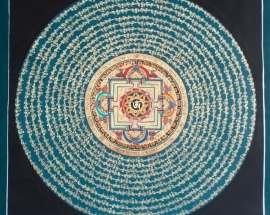 Mantra Mandala Thangka Painting is striking painting handpainted by Nepali artist living in Bhaktapur. 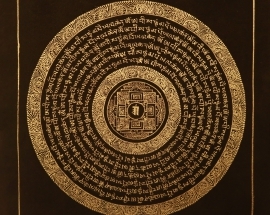 The Om Mani Padme Hum mantra is repeated in 11 times the circular form. In the middle of the mandala, we can see Om. 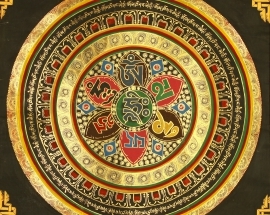 Buddha’s Eyes Mantra Mandala is hand painted by the artist in Nepal. In the inner circle, there is buddha eye which is also known as wisdom eyes and they look out in the four directions to symbolize the omniscience of a Buddha.